Looking for a place to recall some pieces of Philippine history? Visit this Eastern Visayas town and you will surely get the right answer. Basey is said to be the capital of Leyte province during the American occupation before the establishment of Tacloban City, now the regional capital. Features of this tourism destination would take tourists back to Spanish and American occupations until the Japanese era. There are, for instance, the Buscada Chapel and St. Michael the Archangel Church, both located at the town center. Built in the 17th century, these churches are two of the remaining stone churches in the region. Visiting these two churches and looking at their walls, tourists will notice markings that have names written on them. The names were those of the people entombed in the 10-foot thick, coral and limestone walls as part of Spanish tradition. They were well-known townspeople during the Spanish era and some were parish priest who served in the church. Buscada Chapel (Mt. Carmel Chapel) is significant for the people of Tacloban. During the city fiesta, the image of the Holy Child Jesus of Buscada is exchanged with the image of Holy Child Jesus of Tacloban in a ritual called Balyuan. Checking the tombstones at Buscada Chapel, the latest burial in its church wall took place in 1928. Outside Buscada Chapel itself, there are still traces of graves indicating that the church ground was used as a cemetery in the ancient days, along with the 17th century- old St. Michael the Archangel Church. A century-old pulpit that is only used now by the parish priest on special occasions such as Christmas Eve and Holy Week masses and 18th century painting at the ceiling of the church can still be seen at St. Michael Parish Church. The bell tower of this church is visible from Tacloban’s Cancabato Bay area. The most popular among the tourist destinations of Basey is the Sohoton National Park and Natural Bridge, which is about an hour travel from the town proper of Basey. From the entrance of Sohoton Cave, visitors may glance at the Panhulugan Cliff, named by locals after the word "hulog" or drop, the ambush site of Filipino guerrillas against American Forces during the occupation of the Philippines. Two caves can be seen at the Panhulugan cliff, the Panhulugan Cave 1 and 2 that were used as burial sites in the 13th century. Sohoton cave is a cathedral-like dome with an entrance of a parabolic arch-type about 50 meters high. 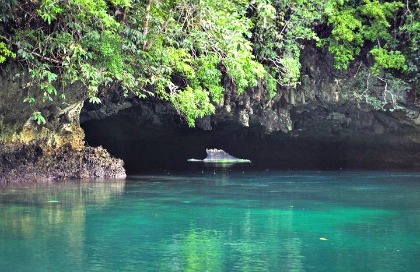 Of the caves inside Sohoton National Park, it is the Sohoton Cave that is most visited by tourists. Sohoton cave has a flat door area near the entrance, about 20 meters in width and 50 meters in length. On its ceiling hangs spike-shaped crystalline stalactites. It has rustic and cavernous walls and stalagmites can be found on the cave’s floor. Inside Sohoton Cave, one can see stalactites and stalagmites formation like pair of eagle legs, image of the Holy Family, stalactites that can create sounds like an organ. At the far end of the cave are a prince-like window and a balcony overlooking the natural swimming pool below. About a 10 to 15 minute kayak ride from Sohoton Cave is the fantastic huge arch-shaped rock Sohoton Natural Bridge that connects two mountain ridges spanning to the Sohoton River. This stone bridge is forested at its upper portion while on its underside hang heavy karst formations of giant stalactites and a river that until now is used by the locals in transporting their goods. The river under the natural bridge is ideal for picnics, swimming and kayaking. Also found in Sohoton National Park are the Bugasan and Kapigtan caves that are off limits to visitors due to ancient remains that dated back from Stone and Iron Age periods. A visit to Basey is not complete without checking the centuries-old tradition of Baseynon --a tradition that was passed from generation to generation, the tradition of mat weaving. Basey is famous for its banig (mat), a prime handicraft product that is made from indigenous material tikog, a grass that is abundant in Leyte and Samar. Basey banig weavers, mostly women, do their weaving inside Soob Cave in Mabini village along the national highway. The cold temperature inside the cave helps preserve the raw materials, according to local weavers. The weavers are locally known as paraglara and are taught the traditional mat weaving at an early age. It is believed that the people in Basey have been weaving mats long before the Spaniards came to the Philippines. From the traditional banig, mat weavers in Basey have expanded their products to bags, wallets, slippers and other decorative materials. The colorful and bigger a banig product is, the more expensive it is. Their products have reached as far as the United States and several other countries around the world. A more complicated mat design showing the likeness of a public figure or a “portrait mat” is also sold in this town. This technique, which can be compared with embroidery, is done by experts mat weavers at the town proper. Super typhoon "Yolanda" had greatly affected the mat weavers of Basey after their source of materials were destroyed, but a private group and the local government unit had worked together to bring back this industry by organizing farmers and identifying a village of Basey where they could grow tikog. In the other part of Sa-ob Cave, one can find skeletal remains of people that were placed in a tomb inside the cave. Residents in Basiao village where Sa-ob cave is located said the skeletons belonged to people who died during World War II.